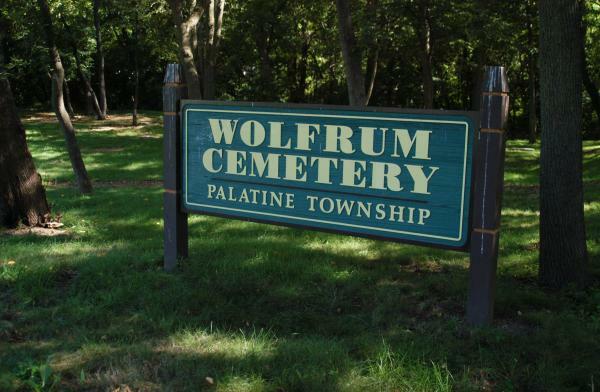 Wolfrum Cemetery is a small, nearly forgotten graveyard in Rolling Meadows, Cook County, Illinois. This family cemetery was originally on land belonging to farmer Orrin Ford. For many years it was forgotten and neglected, suffering much damage, until Palatine Township took over the site in the 1990s. Today, the graveyard is located behind houses in a residential subdivision with winding roads. A small, ordinary looking gate stands across a path that leads to a wooded area, several hundred feet back from the street, in which the township's new wooden sign can be seen. Behind it, no monuments remain standing; all are horizontal, set into concrete frames.